WORKING TO "KEEP HISTORY ABOVE WATER"
The 10-acre campus of Strawbery Banke incorporates the Puddle Dock neighborhood, named for its earliest incarnation as a tidal inlet. Though the inlet has been filled, the tide still affects the groundwater in the land beneath houses such as Shapley-Drisco (above). During King Tide events, where tides average 2+ feet above normal due to the alignment of sun and moon and their proximity to the Earth, groundwater in these basements rises with the tide. 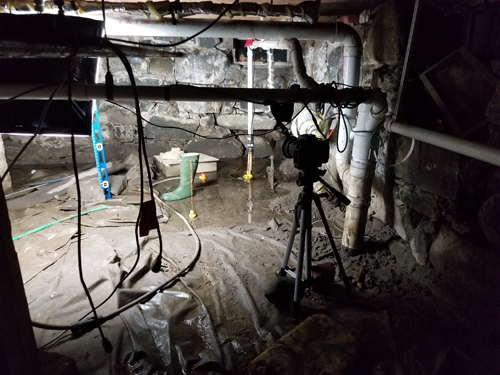 Click here or on the photo for a link to a time-lapse video of the King Tide event in the dirt floor basement of Shapley Drisco House on December 5, 2017. 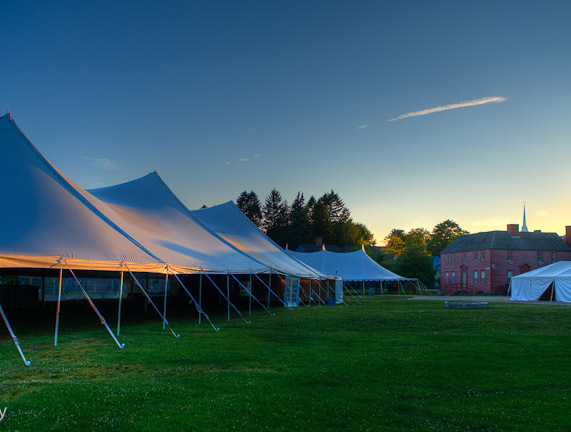 Strawbery Banke is engaged in many projects that may physically extend beyond the 10-acre campus but that impact the future of the museum. Yankee Magazine featured Strawbery Banke's response to the challenge in the Mar/Apr cover story, "Rising Seas." Keeping History Above Water: Annapolis was an international gathering of over 250 experts and practitioners from around the country hosted by the City of Annapolis with support from the Newport Restoration Foundation. Conference discussions examined the increasing and varied risks posed by sea level rise to historic coastal communities, their built environments and traditional ways of life. 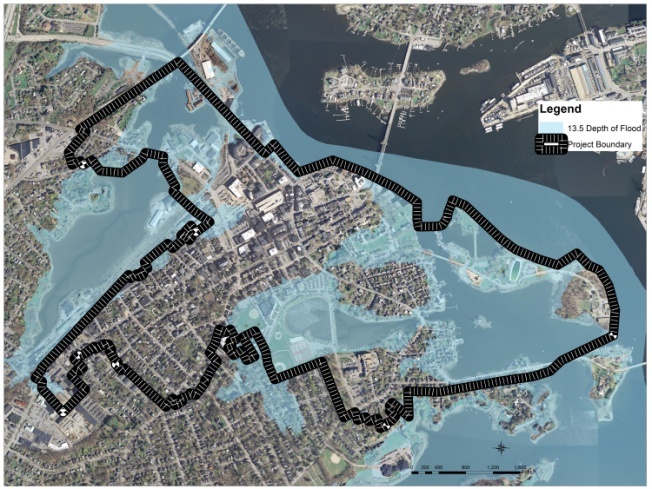 Because Strawbery Banke is among the lowest points in the city and a natural conduit for draining water, the presentation Illustrations included photographs of Strawbery Banke and a set of flood elevation maps including the example shown, a vulnerability assessment, a preliminary outline of potential adaptation strategies, and recommendations for future planning, regulation and policies. UNH Geospatial Lab ongoing research and student initiatives described in this blog and this Boston 25 news segment. American Association of State and Local History webinar on museums and climate change and Strawbery Banke AASLH blog. Sustainable Museums/UN Sustainable Development initiative. NH Preservation Alliance "Wet Basements" Workshop. NH Engineering Conference, Concord NH to explore options to ameliorate basement ground water flooding. 3S Artspace guest artist, Yu-Wen-Wu, installation (March 2019).